Hello! Thank you for visiting my blog. I’m Joni, a self professed foodie adventurer. I regularly travel for my day job around the country. I love trying anything new as well as finding the “best I’ve ever had”. I hope to inspire you to try new things as I take you along my Good Nom Adventures. Good Nom Adventures Travel. Food. Fun. My first food walking tour was during my first visit to Portland, OR about four years ago. It was a foodie’s dream and I discovered new places that to this day are always on my bucket list when I visit. Austin has such a vibrant food scene, especially considering that it’s known as Portland’s sister city. I just knew there had to be one and low and behold, the Austin Eats Food Tour. Austin Eats offers two food tours, one of food trucks on Saturdays and the other of places on South Congress on Sundays. Since Saturday was taken up by my BBQ adventure (remember Salt Lick?! ), I signed up for the Sunday tour and had another friend join me for the fun. The tour is about 3 hours long and starts out on the corner of South Congress and James at the famous Jo’s Coffee. Jo’s serves some delicious morning java along with various pastries and of course breakfast tacos. When we arrived there was a line at Jo’s and it seemed never-ending as the morning went on. The famous “I love you so much” was painted on the side building and definitely offered a great photo op. Our next stop was the Snack Bar, which is attached the ever famous Austin Motel. We were given great background about the hotel and the history behind the different places along South Congress Ave. The storytelling, as told by the lovely owner Bethany, was second only what she served us. 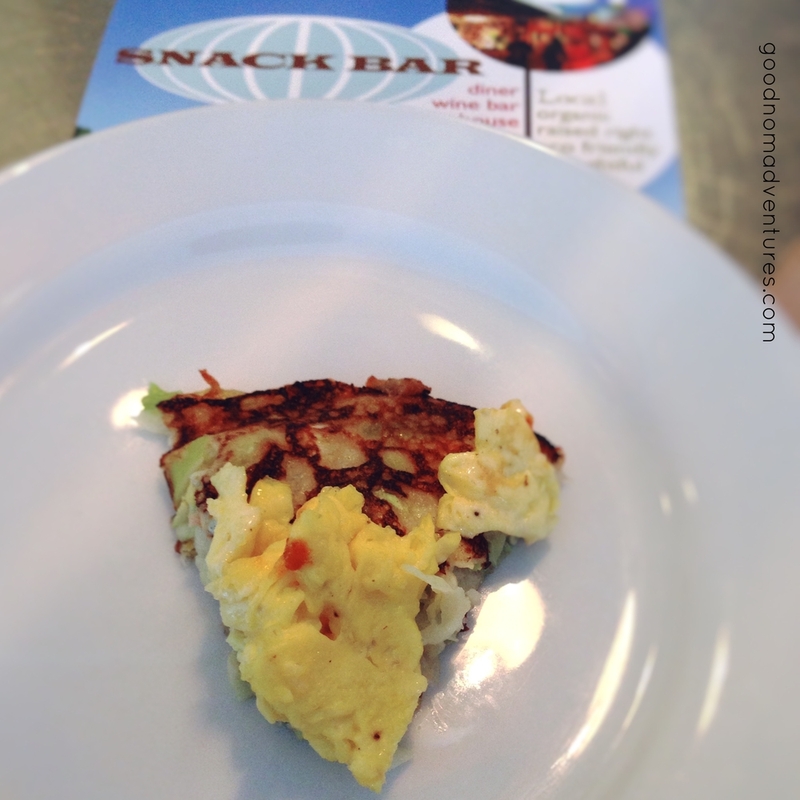 We had a slice of breakfast heaven with the Tamago Yoko, which was a delicious hash cake made with bacon, shrimp, cabbage and leek mixed with perfectly scrambled eggs. It was a great start to the tour. We walked over to Guero’s Taco Bar where they had a taco al pastor waiting for us along with chips and queso. The queso was creamy and I couldn’t get enough of it. The taco was made with marinated pork and simply topped with onions, cilantro and pineapple. The pineapple was a surprising addition and added brightness and freshness to the taco. And who could really not enjoy a taco without a sample of Guero's margarita. Next it was burger time over at Hopdoddy Burger Bar. Hopdoddy was a destination on my bucket list so I was very excited to try a burger, fries and shake. I was especially excited when we didn’t have to wait in line. Every time I pass by Hopdoddy the line is out the door and around the building. But I can completely understand why. We had the classic burger and it was the highlight of the tour. The patty was thick and juicy and the bread was soft and buttery. It was simple and had great flavor. We also had the salted caramel milkshake, which was silky smooth with a nice balance of sweet and salty. The tour was definitely not over as we made our way to Burro Cheese Kitchen, a food truck near the corner of Congress and James that serves grilled cheese sandwiches. Burro is hard to miss with its bright yellow truck underneath a huge tree. But don’t think that this is just any ordinary grilled cheese food truck. They serve artisan grilled cheese sandwiches and use the best local cheese from Antonelli’s Cheese Shop and bread from Easy Tiger. 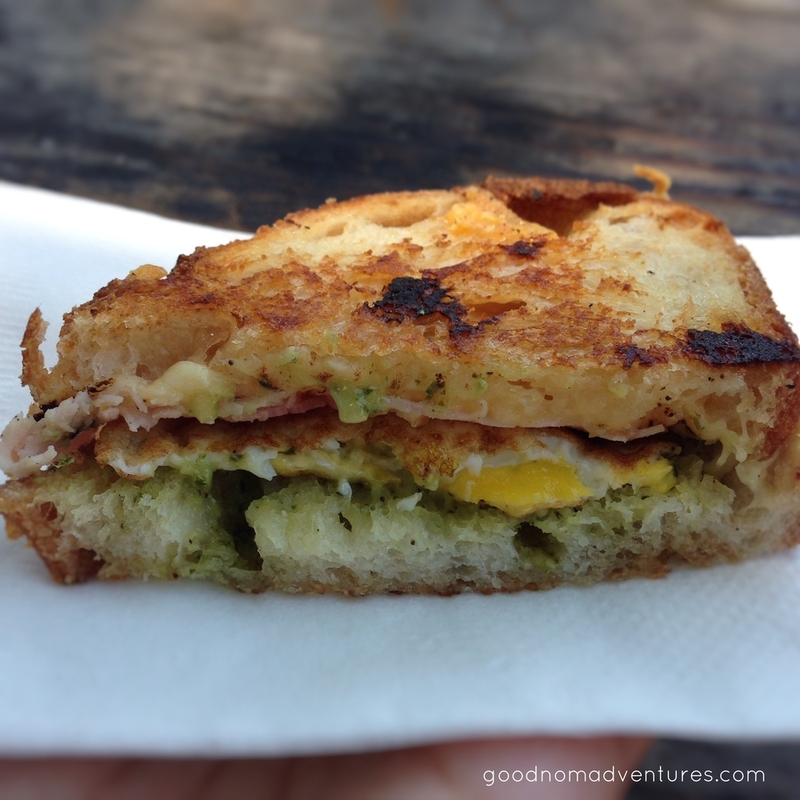 We were offered the Croque-Madame, a ham and cheese sandwich topped with a fried egg. It was the best ham and cheese sandwich I’ve had in a long time. Not only was it topped with a fried egg – let’s be honest, a fried egg makes everything better – but the sourdough bread had a pesto aioli spread that elevated the sandwich to the next level. Our last stop was the ever famous Home Slice Pizza. Home Slice holds a special place in my adventure book because it was the first restaurant I went to in Austin. It set the bar high, but I knew Austin would always deliver. Home Slice serves NY-style pizza with a thin crust along with other great Italian food like sub sandwiches and calzones. I had a slice of pepperoni and mushrooms. It was great way to end a great food tour. I highly recommend booking a food walking tour with Austin Eats. You’ll learn about how the food scene came to be not only from the people you meet along the way, but also from your tour guide like Brian (with an i). He was very knowledgeable and super friendly, which is what all tour guides should be.